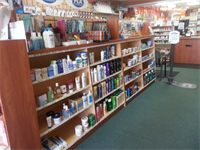 We accept most third party prescription plans including Medicare part D.
We bill Medicare for Diabetic supplies. Orthopedic Goods and Bracing, Arthritis Products. Broad availability of brand and generic prescription medications. Private-label, over the counter medications. Did this pharmacy have your prescription ready when you arrived at the designated pick up time? Absolutely! They are never late!